Reinhold Messner is a superstar, period! He has climbed every mountain above 8 000 metres without bottled oxygen; and was the first person to summit Mt. Everest, solo! The Messner Mountain Museum Corones located on the peak of Mt. Kronplatz (2 275 meters above sea level) is the grand finale to a series of six Messner Mountain Museums. Nestled in South Tyrol’s most popular skiing destination with panoramic views towards alpine peaks, the museum presents 250 years of modern mountaineering with the documentation of both the tragedies and triumphs of some of the world’s most famous peaks. With thriving sports and recreational amenities at the summit of Mt. Kronplatz, the museum was envisioned to add a much needed cultural and educational facet to the locale. Thus, throughout the year, visiting parties would get the opportunity to be privy to Messner’s world of how humanity has pushed the limits and overcome insurmountable odds. The design team at Zaha Hadid explored the idea of submerging the building within the summit itself; so that in a sense, the visiting patron could descend into the mountain itself to appreciate the ‘gems’ it had to offer, before emerging on the other side to breathtaking vistas. The MMM Corones is made up of in-situ cast concrete that engenders the hardness and enduring qualities of the timeless Mt. Kronplatz. The entrance, fenestration as well as the viewing platforms abstract the forms of surrounding jagged ice and rock formations. The alpine colour palette is composed of darker greens and greys that are capped with shades of white of the rolling snow peaks. It is upon this reflection that the architects chose to give the exterior skin of the museum a lighter shade of glass reinforced concrete. Within, the interior walls took up a darker lustre with tones that were inspired by the substrate of the mountain itself. Once inside, a series of staircases cascade to circulate visitors on the three levels of exhibition spaces. Here, mountaineering equipment as well as relics, thoughts and works of art of the backdrop of the surrounding mountains are presented. At the lowest level, visitors emerge onto a terrace which cantilevers 6 meters to offer 240 degrees of panoramic views towards the Alps. 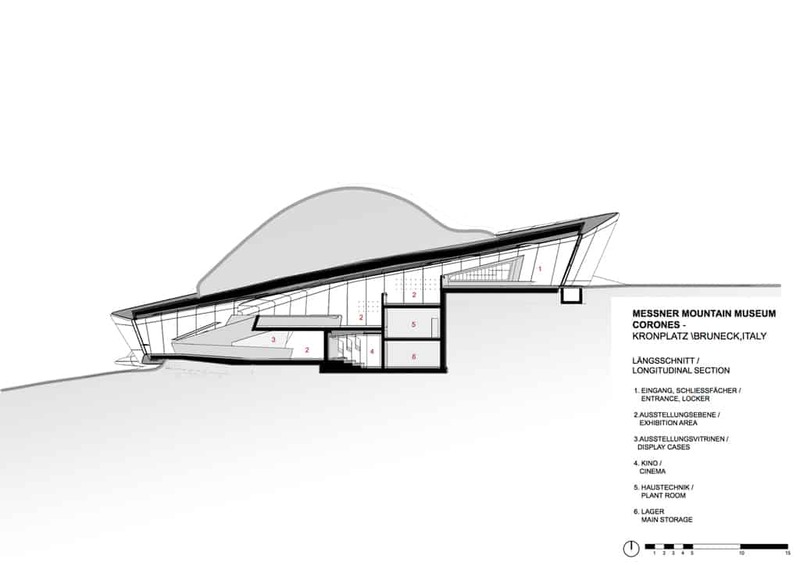 With only one entrance, the museum’s form divides into three arms that upon Mr. Messner’s guidance, point to three significant peaks: Peitlerkofel on the southwest, Heiligkreuzkofel towards the south and the Ortler on the west. To reduce its 1 000 sqm footprint, the museum’s interior spaces were designed to occupied on three levels. And to immerse the museum within the mountain, over 4 000 cubic metres of earth were excavated and later filled on top of the structure once the construction was done. This infill also helped to regulate the internal thermal environment. The concrete envelope of the building was on average about 400 to 500mm but thickened to about 700mm on the roof level to support the earth infill. With a huge portfolio of ‘starchitecture’; ZHA has overseen the design of many iconic buildings worldwide. Their architecture which explores organic and parametric possibilities such as in the Heydar Aliyev Centre; have received critical acclaim. Some of their works, however, have been bashed for being inconsiderate of their context at the expense of achieving the wow-factor. 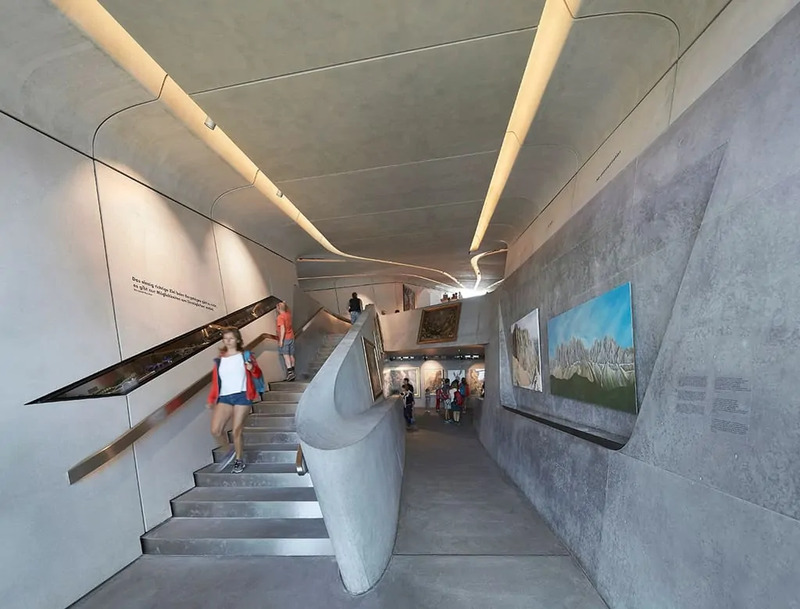 That being said, it is noteworthy to appreciate the careful thinking that went into the design of the Messner Mountain Museum at Corones to integrate it into the mountain’s summit. Being modest on the outside, whilst stark and bold on the inside; easily places it as one of the most illustrious buildings designed by the British architecture firm.